Sammy was officially registered for t-ball this evening. Before we got out of the car to go into the school, Uncle asked Sam who was the first African American to play National League ball, and with minimal prompting he knew. I was so proud of both of them. Marcel was busy screaming that he wanted to register too. Yes, I was that mom. I did. I asked if he had to play t-ball, or could he just bump right up to little league. I explained that he rode a bike at two, and has been hitting hard ball fast pitches since he was four… People put their pens down to listen, two coaches came in a few inches closer. I felt the power. Is this woman talking trash? Or is that not so little boy playing with his pipe cleaner and bead necklace the next Sammy Sossa- they wondered-as Sammy sized up the competition on one mother’s lap. If he is so advanced, or strong that having him on the t-ball team might endanger the safety of other players he’ll be moved up, the soft brown eyed man reassured me. Sam disappeared around the corner with Uncle and Marcel as I wrote out the check. Thank you Jackie. Because of you I will get to be that proud, exuberant parent. But more importantly, because of you he gets to be that good. It’s true. But not just because of Jackie. 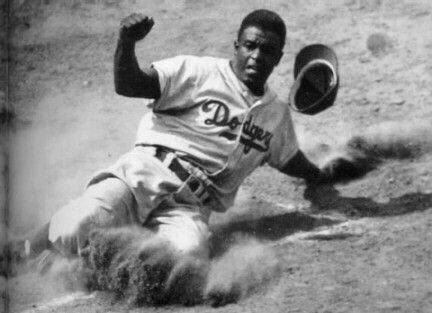 Because of Josh Gibson, and Mule Suttles, and Judy Johnson, and Bullet Joe Rogan, and Turkey Stearns and hundreds of other stars, as great or better than Jackie (as players – no-one was his equal in character), that made what Jackie did possible. Where does This Black History Go?